Lexi/Toshy 7 Puppies – Born April 17, 2019 – 75% chance of having some long hair puppies in this litter – I might have some puppies available from this litter. It will all depend on how many puppies are long hair. This litter comes with: AKC Registration Application, Current on vaccinations, Health and Hip/Elbow Guarantee. You can be confident that you are getting a healthy, happy, well adjusted and socialized puppy! If you are interested in getting on the list for one of these puppies, please click here (or on the tab above “I’m Interested”) to learn what to do next. Lady/Toshy Litter – Born: Feb. 18, 2019 – Puppies are 8 weeks old and ready to go to their forever home. “Hurry, only 1 male still available”! DNA Test Results for Nine Genetic Diseases Lady is not at risk for any of these genetic diseases tested for. Coat Length DNA Test Results Lady cannot produce long hair puppies. Sire: VA1(NL), V4(BSZS-World Championship) Xentos von der Wilhelmswarte IPO3, Kkl, son of World champion VA BSZS Mentos vom Osterberger-Land SchH3, Kkl, grandson of World champion VA (BSZS) VA1(LUX, ITA, BEL) Nando vom Gollerweiher SchH3,Kkl, and great-grandson of World Sieger VA1 Zamp vom Thermodos SchH3, Kkl. Dam: SG1 Miss Ella von Morgen Haus IPO1, daughter of “VA3 (CAN) Griff vom TeMar (WUSV 2012) SchH3, IPO3, FH, KKl1” (Griff received a special reward for his protection performance at the 2011 NASS), granddaughter of World champion VA3 Dux De Cuatro Flores SchH3, FH1 and USA UNIV. SIEGERIN V Ule v TeMar SchH3, FH1. Lady’s pedigree is packed full of Champions! Lady is a beautiful, large, lean, athletic female. 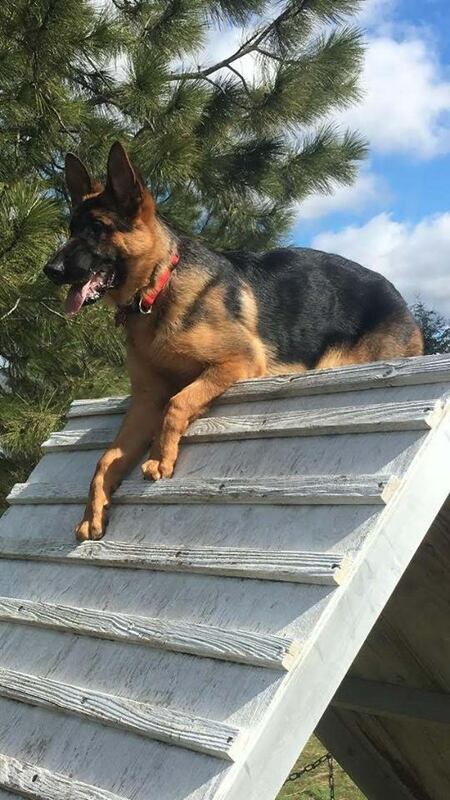 She is super smart, very alert, confident dog with a social outgoing personality, but is very serious when it comes to protecting her family and property. One of Lady’s favorite past times is having her belly rubbed. It is not uncommon for Lady to roll over on her back in expectation of a good belly rub whenever we approach her. 9 Week Old Male Puppy (Green Collar) For Sale! He is a stock hair puppy, not a long hair puppy. His Parents are Lady and Toshy. If you are interested in buying this puppy please fill out my “I’m Interested” page and I will get back with you as soon as possible with more information about this adorable puppy and his parents. Green Collar Male 9 Weeks Old “For Sale”! Green (puppy on your left) and Black Collar Kissing! Contact us for available dogs. Check out our “Puppies” page for upcoming puppies available.